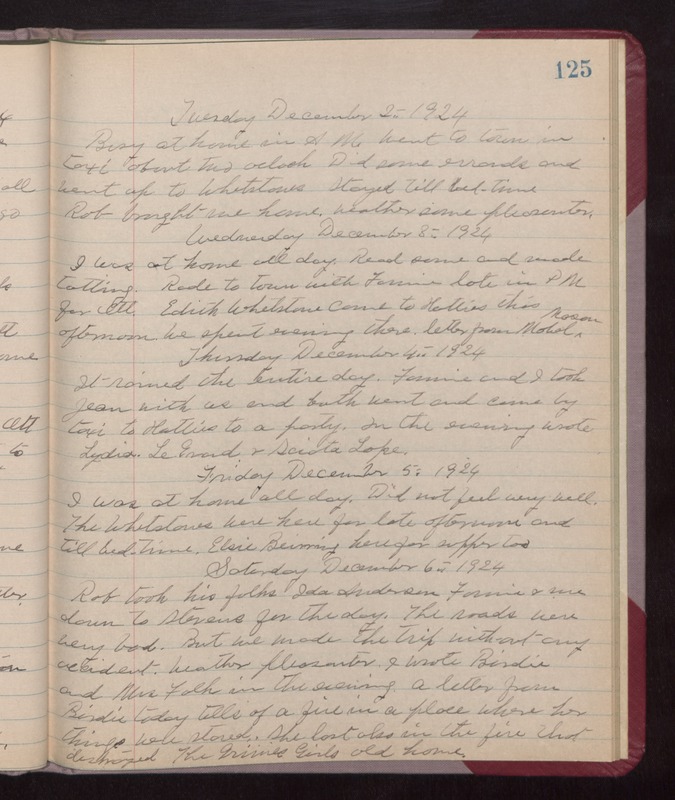 Tuesday December 2nd 1924 Busy at home in AM. Went to town in taxi about two oclock. Did some errands and went up to Whetstones. Stayed till bed-time. Rob brought me home. Weather some pleasanter. Wednesday December 3rd 1924 I was at home all day. Read some and made tatting. Rode to town with Fannie late in PM for Ott. Edith Whetstone came to Hattie this afternoon. We spent evening there. Letter from Mabel Mason. Thursday December 4th 1924 It rained the entire day. Fannie and I took Jean with us and both went and came by taxi to Hatties to a party. In the evening wrote Lydia, LeGrand & Sciota Lape. Friday December 5th 1924 I was at home all day. Did not feel very well. The Whetstones were here for late afternoon and till bed-time. Elsie Beirring here for supper too. Saturday December 6th 1924 Rob took his folks, Ida Anderson, Fannie & me down to Stevens for the day. The roads were very bad. But we made the trip without any accident. Weather pleasanter. I wrote Birdie and Mrs Falk in the evening. A letter from Birdie today tells of a fire in a place where her things were stored. She lost also in the fire that destroyed The Grimes Girls old home.